Back in June 2018 I received a contract for a third novel in the Inspector James Given series (it didn’t start out as a series but has just grown that way) and, despite my slackness until I agreed a deadline, I completed the first draft by the last week in November. Hurrah! I even got as far as devising a working title – it’s been James Given #3 for the last 5 months but now is called A Patient Man for the time being. Finally. The writing of James Given number three has started. I’ve been plotting for a few weeks, and planning to start for much longer, but the actual words on the page have eluded me. True, there have been a few changes in my life over the past few months (selling the house, moving country, etc, etc) and I’ve not quite settled in to a routine yet, but it’s not really a good excuse for not writing. I’ve still been sitting at the keyboard for a few hours every day reading those all-important Facebook posts, checking vital emails from holiday companies, and generally wasting time. I’ve told myself that if only I was still able to go into my favourite coffee shop (Mrs B’s in Killybegs, County Donegal if you’re passing) the prose would flow, though I know it isn’t the reason. The real reason is I’ve just been too lazy and easily distracted – not a good combination for a writer. I did have a traumatic experience in one new café though – I was accused by one of the locals of writing down everything that was being said. He might have been right but I wasn’t going to admit it! So, to get a grip, I started to plot. I began with a vague notion of a body being found – there almost always is, you know – then asked ‘how did it get there?’. A chance encounter with a ‘what’s on’ guide gave me a murder weapon. Whilst thinking about who the villain might be, I wrote a ledger for the victim using some characteristics from someone in a newspaper article. The murderer came to me part way through the poor corpse’s scribblings so I wrote their journal next. Then, using a three act structure passed to me in a recent workshop, I sketched out the three main storylines. Today, I wrote the end, then the beginning. At least it’s a start, and only 75,000 more words to join them together. A few days ago I was chatting to a writer friend who was saying she’d submitted to around 30 publishers and agents without success before self-publishing. Her book has sold a couple of hundred copies to date and has been widely praised, so why no traditional publisher? The first is obvious – write a good piece of work and edit it until you’re happy it’s finished. It won’t actually be finished because the publisher will have their own views on the need for changes, but it needs to be as good as you can get it before you submit. The second is also obvious if you think about it – you need luck. There are a limited number of publishers out there and they’re all trying to be a commercial success. Nothing wrong with that, they need to pay the bills same as anyone else. As I result, they will be cautious about what they take on and more likely to go with known names, famous/infamous writers of autobiography, or the current fashion. So the luck comes in at least three ways: either be famous, somehow hit the current trend (but don’t forget that the current trend was probably commissioned a couple of years ago and publishers have moved on to the next one), or hit on a publisher who currently has a space in their list. Thirdly, research and focus – There’s very little point sending material to publishers who don’t accept unsolicited manuscripts or who only accept submissions through an agent. Equally, there’s even less point sending your noir-crime novel, regardless of how good it is, to a publisher who specialises in literary fiction or science fiction. The internet enables us to both identify publishers with an interest in our particular genre and then research them in detail. When I started to submit A Shadowed Livery I looked through the Writers’ and Artists’ Yearbook and highlighted all of the publishers who published crime fiction. Then I stumbled upon a list of these on the ‘net so added a few from the Yearbook which had been missed. There were, I believe, 63 on the final list. I then went through the websites of every one and weeded out those who were not taking submissions or who only took them via an agent. This left me about 13. Further research took out the ‘vanity’ publishers and those where their preferred sub-genre or target group didn’t match my novel. This left me with eight publishers I felt confident I could approach. The final bit of research was to be clear about the submission requirements and to then follow them to the letter. Virtually all of them were different. I was lucky enough to find three who expressed further interest and then went with one who definitely wanted to proceed. So, even with all the initial research, there was interest from less than five percent of the initial list – but if I had simply used a scatter-gun approach, firing off submissions just anywhere, I might not even have hit that figure. On the other hand, I might have. What did I say about luck? Last time I blogged I thought I was facing a major rewrite but over the past few days it’s become clearer I simply need to make some small amendments, a line here, a word or two there, then deal with the resolution differently and all should be fine. As I haven’t written the resolution yet this shouldn’t be a major problem. It is fascinating how, as authors, we devise seemingly insurmountable barriers for ourselves which, in the cold light of day, are little more than molehills which are easily levelled or skirted around. My wife is also a writer and we share our tribulations so I’m lucky. If she can’t help then I also have a support backup in my writers’ group who can either offer a solution or at least act as a sounding board until I find one for myself. As the BeeGees once sang ‘it’s only words, but words are all I have’ – shame they’re such awkward sods sometimes! My, my. I’ve arrived at a difficult place. Sixty one thousand words into my second novel and I’ve worked out I don’t know where it’s going. It’s a mystery in which Inspector James Given is investigating a case where a mummified body has been found in the crypt of a school chapel. It’s not the case which is the problem, that’s all fairly well plotted, but I think I’ve realised that the murder itself isn’t the main issue for my hero. Well, I’ve known all along it isn’t, but now I realise I probably haven’t written the first draft with this in mind and will need to do a considerable amount of work to get it back on track. Fortunately, I do have a second case he is working on and this probably needs to become the major case, rather than a sub-plot. Interestingly, I’ve only discovered this flaw when I was working on a synopsis to approach potential agents. I was following an outline in a blog from Glen C Strathy based on Dramatica principles and realised my main character might solve the crime but won’t actually change as a result. Ah well, back to the drawing board. At least I now know one of the reasons why I’ve been stuck on this synopsis for the past couple of weeks. This week I visited The Four Masters bookshop in Donegal Town to ask if they’d take some of books. To my surprise, and unbounded joy, they already had them on the shelf. I was so impressed I’ve put a photo as my new header image. 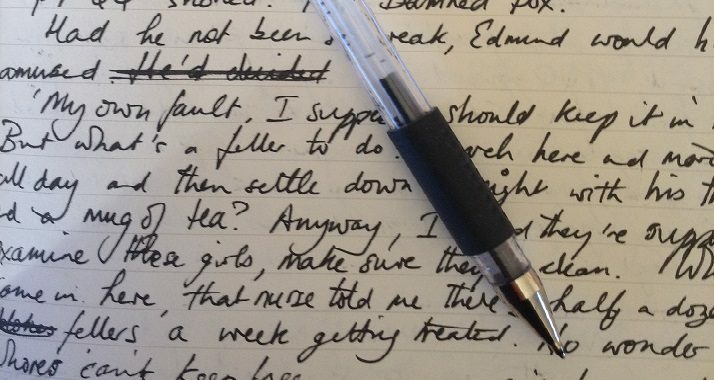 I’m plodding through my redraft of my current novel, though it is something to be undertaken in small bites. 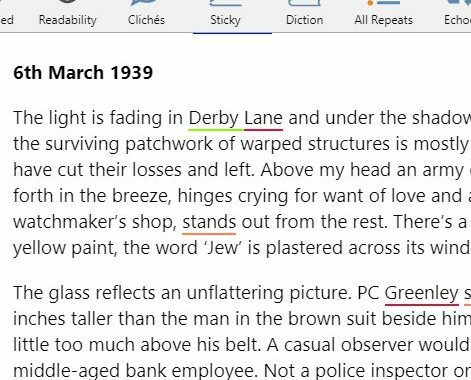 This morning, due to associated research to check what was in the news in March 1939, it took me around two hours to get to 300 words. I feel that accuracy is important but sometimes it takes so long to find material which will only provide half a line in the manuscript. Still, it is easier than trawling through a physical library. Actually, it was an interesting time historically, Germany invaded Czechoslovakia, finally bringing Europe to the brink of war and the siege of Madrid was almost at an end, cementing Franco as head of Spain and bringing the Spanish Civil War to a close. Also, as an avoidance technique, I’m checking my Amazon ratings from time to time. Aren’t they strange? I had a very nice review on the Crime Fiction Lover website a few days ago and it must have resulted in some sales, I imagine only 2 or 3 , but I shot several hundred thousand places up the ratings on Amazon. Last night we launched A Shadowed Livery in Ireland. It was a great evening, starting with general chat and excellent background piano, then some very kind words from a friend and writer about the ‘new man in her life’ – not me but Inspector James Given, the protagonist in my novel who she followed for months when we shared our latest scribblings in our writers’ group. The food (which included Donegal sheep’s cheese – it’s a new one on me too) and drink flowed until we settled down to a couple of hours of a traditional music session. We sold some books too, but that was almost incidental to the good time we had. I’m always fascinated when I do a reading, or attend one, how attentive an audience can be. It confirms for me that we have an innate desire to be told stories, to be taken away from our own world and lifted, albeit temporarily, to another. Last night I read only a couple of pages but I was approached by several people afterwards wanting to know what happened next, further testament of the power of the written word. So that’s it then. After months and months of waiting I clicked onto Amazon this morning and there it is. Finally published. I finished my first draft in November 2012, had interest from a publisher in August 2013 and received a contract in February 2014. It’s taken the last year and some months to redraft and edit then put it out into the market place. And I can’t even remember when I started writing it! I certainly have fairly complete drafts from as far back as mid-2010. I never imagined when I wrote ‘The end’ with a flourish in my first draft that the remainder of the journey would take so long. Along the way, however, I’ve met some fine people who have helped me to improve my writing and how to think about things differently. People with lots of dedication to the art and craft of books, without whom I wouldn’t have reached the end. To them, a million thanks.